Since I’m in the mood for something indulgent today (ahh gloomy weather), I thought I’d share these caramels with you. I made them for the holidays (for gifts), and completely forgot about them until I went through my SD card this week! I was pretty skeptical that these wouldn’t turn out well. First of all, I’m not good with candy (I always either overcook or undercook them), and also, because these caramels aren’t made the standard way. 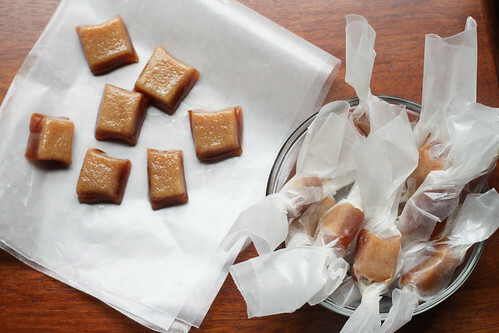 However, I should always trust Deb of Smitten Kitchen….these caramels were delicious, and they turned out perfectly! They were like apple pie in caramel form, and I couldn’t stop eating them haha! It was the one treat I just kept snacking on, actually. No willpower when it comes to these. Also, another bonus besides having a ton of caramel candies? Your house will smell fantastic after making these! Place the apple cider in a 3-4 quart saucepan, and boil it over high heat for about 35-45 minutes (stirring occasionally), until it has reduced to about 1/3 and 1/2 cup in volume and turns into a dark, thick syrup. While the cider is boiling, prepare an 8×8 inch square pan by fully lining the bottom and sides of the pan with 2 sheets of parchment paper. Set the pan aside. Then, stir together the cinnamon and flaky salt in a small bowl or dish. Once the apple cider has reduced, remove it from the heat and add in the butter, sugars and heavy cream. Stir the mixture well, and place the pan over medium-high heat with a candy thermometer attached to the side. Allow the mixture to boil until the thermometer reads 252 degrees, which will take about 5 minutes. Once the mixture reaches temperature, immediately remove the caramel from heat and add the cinnamon/flaky salt mixture. Stir well to distribute the cinnamon/flaky salt mixture evenly. Then immediately pour the caramel into the prepared 8×8 pan. Let the caramel cool in the pan fully, for about 2 hours, until it’s firm. Once the caramel has cooled enough, use the parchment paper to move the block of caramel to a cutting board. Add oil to a pizza cutter or knife, and cut the caramels into 1″ squares (being sure to oil your knife/cutter as often as necessary, since the caramel is very sticky). Wrap each 1″ square into a 4″ square of wax paper, and twist the sides to close. Keep them stored in an airtight container (they’re good for about two weeks, according to the cookbook…I have no idea from experience because they were probably consumed within a couple of days).